For anyone who has tried to join the barefoot running craze without success, On Running may have the answer to your aching Achilles, blisters, and stress fractures. The innovative design of On Running shoes allows an almost barefoot feel, without the shock. At least that is the idea behind On, according to Co-Founder, Olivier Bernhard. And he should know something about running. Bernard is a six-time Ironman champion. Stepping into the Cloudsurfer was a treat right away. Besides being a good-looking shoe (I got a few compliments the first day I wore them), the Cloudsurfer fit perfectly, was extremely lightweight and was comfortable on day one. I've tried minimal running shoes in the past, but always went back to a traditional shoe. The barefoot and minimal shoes tend to be a rough ride and require a big dose of patience and gradual progression that I just didn't want to make time for—I want to put on my shoes and go run. After developing some aches in my Achilles tendon and some nagging calf pain, I decided not to continue with the minimal shoes in fear of developing a more severe injury. So, giving the Cloudsurfer a spin was my next attempt at running with a minimalist shoe. I had high expectations, simply because they looked so good and felt good while walking. So, I hoped for the best and took off on a few short runs, and gradually built up the time and distance to give the Cloudsurfer a good demo. What's Different About On Running Shoes? The whole idea behind On Running Shoes is to "land soft, and push-off hard." The design reflects this concept. The bottom of the shoe is made from their patented CloudTec™ system. Basically, there are flexible, hollow, circular rubber tubes (they call "clouds") along the bottom of the shoe that compress flat when you land, and allow you to push off as though you are barefoot. In theory, the shoe absorbs the shock of the landing but has a barefoot feel the rest of the time. The makers say this design helps prepares the muscles for landing and allows a smoother transition into the stride, and then the "clouds" lock and provide a solid surface so the runner can push off with explosive force. Although they claim, "the activation of the running muscles reduces the risk of injury and shortens recovery times with no adaption time needed," I found that, just like any minimal shoe, you need to gradually build up your time wearing them or you may end up with the same aches and pains as you'd have wearing any minimalist shoe. So, after two weeks of short runs on the treadmill, the road, and a few flat trails, I can say the Cloudsurfer will stay in my running shoe rotation. It's not my "go-to" running shoe, but it is light, comfortable and solid enough for most of my 3-5 mile runs. With the airy mesh uppers, it's not the ideal shoe for cool or rainy conditions. My feet got cold on more than one occasion. It would be a good choice for hot summer days, though. The only truly annoying thing about the On shoes is that the little "cloud" tubes on the bottom of the shoe can get caked with debris—dirt, mud, sticks, and stones—if you run off-road or in any muddy conditions. It's not the worst thing, and it's easy enough to clean 'em out, but still, I found this annoying. One less annoying, but still noticeable, characteristic of the shoe, was an audible squeak I heard one day while running in the rain. It wasn't constant and didn't bother me much, but I wondered if that would happen every time I ran in the rain. It was only on one shoe and lasted about 5 minutes and then disappeared. 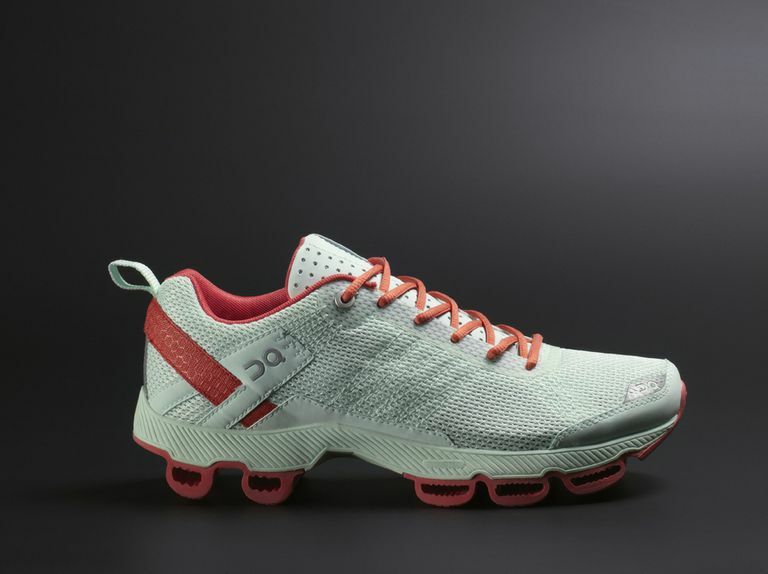 Bottom line: if you want a good-looking, lightweight, minimalist shoe that has some, but not too much, cushion, you may find the On Cloudsurfer a good choice. [On Running also offers the Cloudrunner for a bit more cushion and the less cushioned Cloudracer.] It's a new shoe and with any new-to-market product, time will tell if it's a winner or just another short-lived fad.